The Black Diamond Bombshelter is a state-of-the-art, four-person, four-season single-wall tent with a storm-proof design. Aconcagua’ Yeah, been there. Everest’ Sure, done that. What about gusting winds and four feet of snow’ Yep, the Bombshelter can handle that, too. 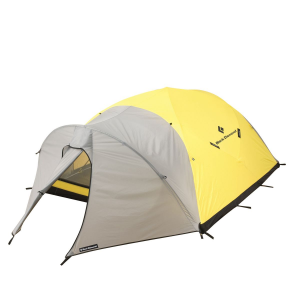 True to its name, this tent is virtually unbeatable in the mountains, or anywhere for that matter. If you’re looking for the ideal team-mountaineering or base-camp tent, you’ll have a hard time finding one that’s stronger or lighter than the Bombshelter.